We love the challenge of applying the principles of awesome training to new languages and cultures. As with designing any course, localization is all about carefully planning. We’ll work with you to adjust the English so that it is appropriate for the intended audience in terms of content. “Yo no hablo Ingles!” or “Je ne parle pas Anglais.” If you get this feedback, it’s a pretty good clue your learners sense that the training wasn’t designed for them specifically. Attention and retention go out the window when learners question a training’s relevancy to them. Just think of how it feels to watch a badly dubbed foreign movie. Subtitles are not an ideal solution. Providing a translated narration transcript isn’t always enough to communicate the lesson. It may meet minimum corporate or legal requirements for providing training in native languages, all the info may be there, but good design builds a link between audio, text, and images. The “this was made for me” feeling is all in the details. You’re just more involved in the story when the actors are actually speaking your language and everything’s in sync. The goal of localization is to adapt learning materials in a fashion that is appropriate for the culture, the original meaning is intact, and the narration and text are in the local languages. When a course localization is done correctly, learners can’t even tell the course was converted from a different language. Take, for example, a company based in the U.S. that also operates in French-speaking Canada, Spain, or Japan. Obviously the narration, or at least the transcript of the narration, needs to be translated for the foreign audience to begin to understand what the course is trying to teach them. But what about the on-screen text – those key words and phrases that emphasize important points of the training? Should that be translated as well? And how about the characters dressed in American garb? Is this dress appropriate for the foreign culture, or could it be offensive? And then let’s consider what is actually being taught. Do they do things exactly the same way we do them here in America, or do business practices and cultural values differ? All these details matter. In order for the foreign learner to get the most out of the training, they need to feel like it was designed specifically for them, and that feeling comes from attention to detail in the localization process. Having done many localization projects, we’ve found that we love doing them. It’s like a trip around the world for us! We love the challenge of applying the principles of awesome training to new languages and cultures. Course localization can happen at some point after the English course has been completed, or, if known in advance, it can be planned for during the creation of the English course. Planning for the translation upfront is typically the more efficient and thorough option. Either way, we’ll work with you to help determine what level of localization is appropriate for the intended audience and what works for your budget. As with designing any course, localization is all about carefully planning. It’s one of those “measure twice, cut once” sort of things. If you don’t believe me, just check out this article! When you throw translating everything in the course on top of the rest of the design, it takes on a whole new level of detail. When translating text and narration, ignoring even the tiniest detail could result in huge unexpected and unnecessary costs. We’ll work with you to adjust the English so that it is appropriate for the intended audience in terms of content, on-screen text and narration, and even graphics. 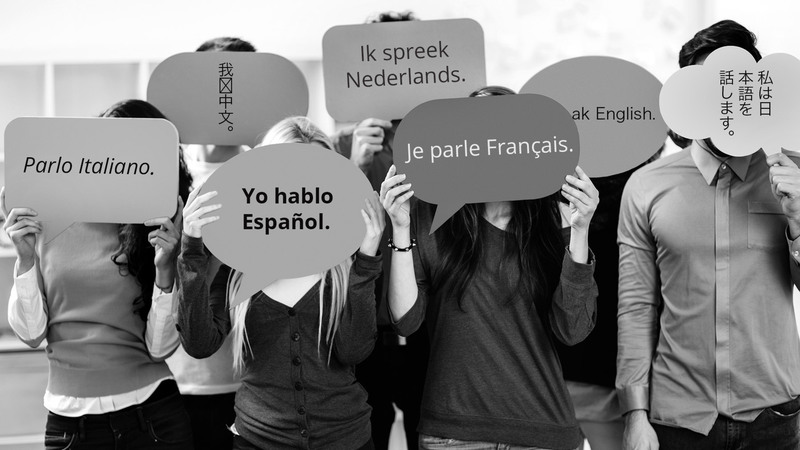 From there, we work with vetted translators to complete the foreign language version of the course. One of our clients created a series of customer service modules (in English) that taught the importance of listening to the customer’s voice. This message drove our original design, which was all about that voice. The eLearning courses were rolled out nationally in the US and were a huge success. So successful, in fact, that the company’s French-Canadian region took notice. The modules had such an impact on customer satisfaction that the Canadian offices wanted to get in on the fun. Because the course had already been completed and none of the original requirements included planning for a second language, we needed to devise a strategy to implement the course in French. Originally the French-Canadian office requested to only translate the audio script and leave everything else in English, as it originally was created. However, it quickly became evident that a course on the voice of the customer, which was clearly not developed for this office’s French-speaking customers, was a real miss. So, it was decided to do a full translation of script, screen text, audio, and labeled graphics. Why? Because the goal of the course was to associate the subtle emotional cues in the customer’s voice with the level of service being provided. Our localization process ensured that the French speaking learners got the same awesome training results as their American counterparts. Vive le training! We love the challenge of applying the principals of awesome training to new languages and cultures. Course localization can happen at some point after the English course has been completed, or, if known in advance, it can be planned for during the creation of the English course. As with designing any course, localization is all about carefully planning. It’s one of those “measure twice, cut once” sort of things. We’ll work with you to adjust the English so that it is appropriate for the intended audience in terms of content. Wait just a second, how is localization different from translation? Great question, because translation is actual the most common aspect of localization. As you probably know, translation is the process of converting the language from one to another. Typically, this means going from English to one or more additional foreign languages. As we described above, this can be just the narration, or every written and spoken word within the course. Localization would include translation, but would also extend to the visual, tonal, and any other culturally relevant aspects of the course. This could mean swapping images of “American” people for those from the target country or region, changing the tone of the course, the color scheme, or the examples used to fit within the desired vibe for the audience. Basically, translation is about converting the language, the rest of localization is about all the other things that make a course feel “at home” to an audience in another culture. Do we have a choice of narrators, and how do we go about selecting one when we don’t speak the language? Selecting the proper voice can often be hard enough when you’re picking between different English-speaking narrators, so adding in a different language only compounds the decision. We will provide you with a choice of narrators to choose from and you can decide which has the proper sound for your audience. Our localization narrators specialize not only in different languages, but different dialects as well. We suggest choosing a representative in your company from that country/region to make that selection. How will we review the course if we don’t speak the language? Before we create the foreign language course, we’ll present the translated text and narration script to you for approval. We suggest choosing a representative in your company from that country/region to do this review, and ensure important information is not lost in the translation. If this is done thoroughly, then the course review should be limited to checking that the course still functions as you expected. How will the foreign folks access the localized course? It may be the same as how courses are accessed now – via your LMS – unless they have their own LMS. I have a course that will need to be translated to 3 languages, but we’re developing the course in English. What do I need to know that will make the localization easier on the back end? As you write the material, keep in mind that other languages typically have more letters per word than English, sometimes up to 30% more! So, try to keep on-slide text short and sweet. For slides that require more text, make sure you leave enough white space for that additional word length. If necessary, split the slide into two slides. Refrain from creating graphics that include text. If a graphic needs text, use a text box on slide and group it with the graphic. This will prevent the cost of editing graphics. Non-English speaking learners? No problem! We'll help you translate and leverage your content, so everyone wins.